In my earlier post, I mentioned that our model designated 2019 as the start of the crisis years which will be a general economic downturn culminating as a global stagflation. This period will be a time for mentality change specifically with the capitalist system which is really just the perfection of the old mercantile system. Capitalism arbitrages equity while mercantilism arbitrages commodities. The mercantile system was created when paper money and instruments were invented by the Dutch. Those value-carrying papers now manifest as fiat dollars from the United States and term sheets and stock certificates for corporate ownership. Capitalists then and now use these papers to control the work of people to execute their grand plans. In the 17th century, those grand plans were the monopoly of the commodities trade and grabbing land from natives. In the 21st century, it is now the ownership of too-big-to-fail global companies which monopolize buying and selling of goods and services. 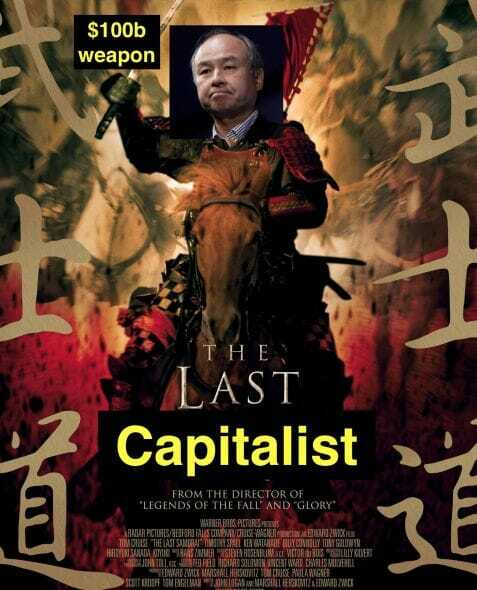 Masayoshi Son is Japan's richest man and is the founder of the venture capital Vision Fund which tries to outdo all other venture capitalists by buying tech companies that can go global and disrupt all the other companies. To do this, he got money from very rich people and used it to buy disruptive companies such as Grab, Uber, WeWork, Flipkart, and NVIDIA. The whole idea is for those companies to disrupt the old industry leaders and then become monopolies, all through their tech advantage. This whole notion is ego-based, because it presupposes that a single supplier can address the needs of all humans. It was the same notion that mercantile companies had, such as the British East India company, which created the first too-big-to-fail company to monopolize international trade. Accordingly, The Vision Fund's companies, such as Uber, WeWork, and ARM for example, have been losing money steadily. In a short time, the Vision Fund is experiencing what the great mercantile companies experienced. History repeats itself and unless those tech monopolies don't change course, we can safely predict that they will also go to ruin like the mercantile companies of the past. The behavior of human ego is consistent throughout history even if it is masked by the most advanced technology, since ego is the cause and technology is just an effect.